IT IS no mean task to detect tuberculosis. Suspects are subjected to a battery of tests, including sputum and molecular, to ascertain the disease. One of the most expensive and widely used by private pathological labs is the blood test. But the World Health Organization (WHO) has issued advisory asking countries to discontinue the use of blood test to detect tuberculosis as it “misdiagnoses and gives inaccurate results”. The WHO recommendation, issued on July 20, is based on the results of two studies conducted by researchers at the McGill University in Canada. The team analysed 92 published studies on accuracy of commercially available blood test for tuberculosis (TB). “The analysis showed the test was neither sensitive nor specific,” says Madhukar Pai, lead author and a biostatistician at the university. There were huge variations in the results, he adds. The sensitivity (testing positive for a TB patient) ranged from zero to 100 per cent and their specificities (testing negative for a healthy person) ranged from 31 to 100 per cent. For extra pulmonary TB (infection affecting parts of body other than the lungs), sensitivities and specificities varied from zero to 100 per cent and 59 to 100 per cent. According to Pai, misdiagnosis is the most dangerous part in blood tests for TB. Blood tests may diagnose you as positive even when you do not have TB, and vice-versa. In such cases, a person may have to unnecessarily undergo medication raising fears of resistance to antibiotics. On the other hand, a patient, if diagnosed negative, may not get timely treatment and transmit the disease to others. Pai notes that blood tests have resulted in 121,000 false-positive diagnoses and 102,000 years were lost for treatment. A study, not included in Pai’s analysis, shows misdiagnosis by blood tests closer home. The study led by Sarman Singh, head of microbiology department at the All India Institute of Medical Sciences (AIIMS) in Delhi, tested serum samples of 470 microbiologically confirmed TB patients and that of 789 healthy persons using a blood test kit, called TB ELISA. Called Pathozyme and manufactured in Scotland, the kit is used by most private laboratories in the country (see ‘Dumped in India’). Singh’s team found the kit tested 28.8 per cent of the healthy people as positive and diagnosed 50 per cent of the fully blown TB cases as negative. 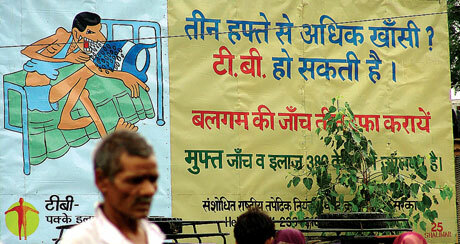 In another study, Pai’s team also analysed the cost effectiveness of the blood test in India. It showed a single blood test cost Rs 920, which was more expensive than the sputum test that cost Rs 156 per two smears. The studies were published in the August 9 issue of PLoS Medicine. According to WHO every year around 1.5 million TB suspects in India are subjected to blood tests at a cost of US $15 million. The rampant use of blood test to detect TB can be attributed to the fact that all the other tests have limitations. Also, blood test is one of the quickest. For example, sputum test prescribed under the Revised National TB Control Programme of the Centre can only diagnose pulmonary TB. The accuracy of the test is 60 per cent and requires three days. To detect extra pulmonary TB and Multi Drug Resistance (MDR) TB, the pus or sputum needs to be cultured and result takes six to eight weeks. A new test, MTP/RIF Xpert molecular (see ‘Diagnosis in two hours’, Down To Earth, October 16-31, 2010), can test pulmonary, extra pulmonary and MDR TB in just two hours, but it requires an installation cost of Rs 4- Rs 5 lakh. 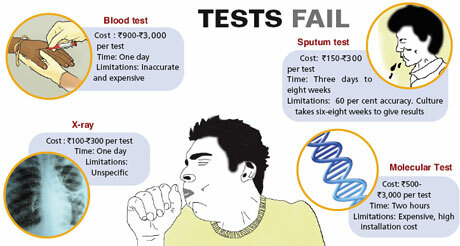 The test costs between Rs 500 and Rs 2,500. This is the reason several national and international institutes are working to develop TB diagnostic technologies which are sensitive, specific, non-invasive, cost effective and can be taken to the point of care. The International Centre for Genetic Engineering and Biotechnology, New Delhi, has found that urine can be used to diagnose TB. The team analysed Volatile Organic Compounds (VOCs) present in urine samples of TB patients. They found that VOCs, which act as biomarkers, in TBÃ”Ã‡Ãªpatients had a distinct pattern than healthy persons. The study was published in the August issue of Analytical Chemistry. “The study used sophisticated technologies like gas chromatography and mass spectrometry to analyse biomarkers. We are in the process of making an instrument which is portable,” says lead author Khalid Muzaffar Banday. His team is also exploring the option of analysing VOCs from breath of TB patients. Efforts are on to improve the sputum test as well. Researchers at the Liverpool School of Tropical Medicine in the UK recently enrolled 6,627 patients from Ethiopia, Nepal, Nigeria and Yemen who had cough for over two weeks. The team tried to find the effect of interval between collections of samples on the efficiency of disease detection. The results showed that a sputum collection scheme in which two samples are taken at an interval of an hour followed by a morning specimen gave equally efficient results as in the conventional scheme where the patient has to give samples thrice for three consecutive days. The team has also used a new microscope, light emitting-diode fluorescence microscope (or LED-FM), to examine sputum. It found that LED-FM is more sensitive (93 per cent) and specific (99 per cent) than the traditional light microscopes. The studies were published in the July issue of PLoS Medicine. Researchers from Bioscience and Innovation Centre in London say the sputum test can also be improved if the sample is concentrated as it can then be retained on the slide for a longer time in comparison to the conventional ones. To concentrate the sample they used magnetic beads coated with a polymeric ligand which binds to the TB bacterium. The study was published in the International Journal of Tuberculosis and Lung Diseases in September 2010. “Until we develop an accurate test that can be taken to the point of care TB will remain a public health concern,” notes Pai.